Andre Gray's goal a minute after coming on sent Watford into the FA Cup semi-finals with a 2-1 win over Crystal Palace. Gray's goal 11 minutes from time booked Watford's place at Wembley for the second time in four years after a passionate quarter-final at Vicarage Road, which the hosts were good value for edging. 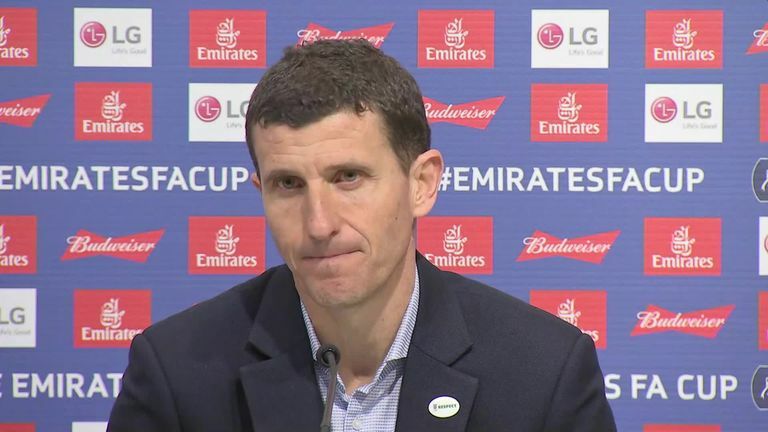 They took advantage of increasing first-half momentum to move ahead on the half-hour when Etienne Capoue was teed up by Craig Cathcart after Vincent Guiata missed a punch from a corner. But Michy Batshuayi then levelled after half-time following a horrible mistake from Adrian Mariappa. The tie looked to be heading to extra-time with clear chances at a premium late on until Gray, who had been on the pitch barely 60 seconds, slotted in Roberto Pereyra's perfect lob to seal their progression. Vicarage Road is rarely a quiet ground but the thunderous noise that greeted every early tackle showed just how much a place in the semi-finals meant to both sets of fans, and that partisan atmosphere continued throughout. 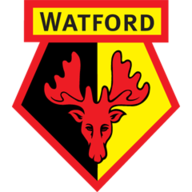 Watford: Gomes (7), Femenia (6), Mariappa (5), Cathcart (7), Holebas (7), Hughes (6), Doucoure (8), Capoue (7), Pereyra (7), Delefeou (8), Deeney (7). 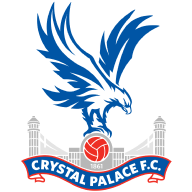 Crystal Palace: Guaita (5), Wan-Bissaka (8), Kelly (5), Tomkins (6), Schlupp (5), Milivojevic (7), Kouyate (6), Meyer (6), McArthur (7), Townsend (6), Batshuayi (6). 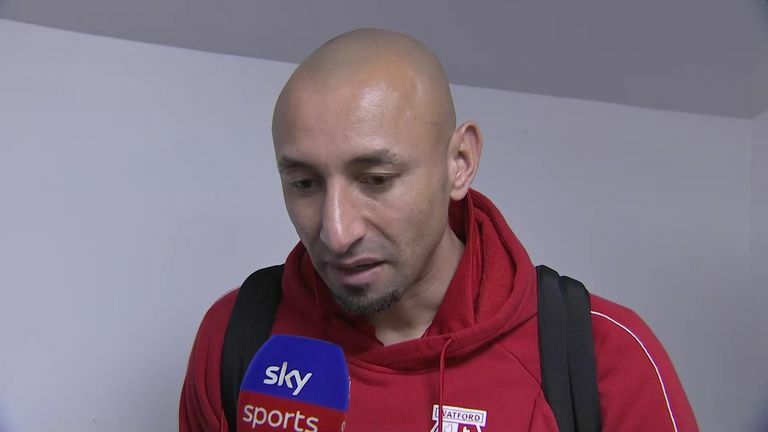 Perhaps it affected Watford early on as it was Palace's players who looked the more ready for the game, flying out of the traps and forcing Heurelho Gomes, who may have been making his Vicarage Road swansong, into a save six minutes in from Luka Milivojevic's drive from the edge of the box. But once the hosts settled they began to take control of the first-half, and Gerard Deulofeu fired a warning shot from the corner of the box which Guaita had to turn over. He looked less comfortable from a succession of corners minutes later, racing into no-man's land before punching behind on one occasion. That tendency to wander then proved his downfall when Watford took the lead after 27 minutes. Jose Holebas' delivery took a nick off the goalkeeper's fist at the near post but dropped for Cathcart on the far side, and he squared for Capoue to fire high into the empty net. Few half-chances followed before the break but after it, Palace came close when Max Meyer's header travelled through a crowd of bodies before Gomes, who saw it late, palmed away well at full-stretch. Watford gave Heurleho Gomes what may be his Vicarage Road swansong, naming the Brazilian in goal as one of eight changes ahead of his planned retirement at the end of the season. Crystal Palace made three changes, with Wilfried Zaha ruled out late on with a hamstring injury, Patrick Van Aanholt dropped from the 18 and Scott Dann also injured. Despite an improvement from the visitors their goal, two minutes after the hour mark, came out of the blue and was one to forget for Watford. Mariappa found himself in trouble when he attempted to play the ball over Batshuayi when the Belgian striker closed him down, and instead it struck the Palace man and set him clean through - and he finished smartly past Gomes to level. Pereyra should have squared for Abdoulaye Doucoure to put the hosts back in front when Guaita found himself out of position from another cross, but instead took the shot on himself and hit it straight at the goalkeeper. Watford were ahead again six minutes later though, as Pereyra lifted a textbook pass over the home defence and Gray ran through to score. There were tears at the final whistle from the winning goalscorer and an emotional Gomes, who plans to retire at the end of the season, but the sadness was all Palace's as the Hornets progressed to the semi-finals for the seventh time in their history. Watford have progressed from their last four FA Cup quarter-final ties, also winning in 2002-03, 2006-07 and 2015-16. Watford have reached the FA Cup semi-finals for the seventh time in their history, although they've eventually progressed to the final just once (1984 under Graham Taylor). Watford have won three games against Crystal Palace in single season for the first time in their history. Crystal Palace manager Roy Hodgson has lost all three of his FA Cup quarter-finals as a manager, also losing with Fulham in 2008-09 and 2009-10. Against no team have Watford won more FA Cup matches than they have versus Crystal Palace (W4 D2 L2). Andre Gray's last three goals for Watford in all competitions have been as a substitute - only Pierre-Emerick Aubameyang and Lucas Perez (4 each) have scored more from the bench among Premier League players this season. Three of Etienne Capoue's four goals for Watford this season have arrived in cup competitions, including scoring two in the FA Cup. Crystal Palace striker Michy Batshuayi has scored in all four of his appearances against Watford in all competitions, scoring five goals in the process. Deulofeu did not get on the scoresheet but he was a delight to watch. The Spanish forward looks confident, sharp and motivated - three things you have rarely heard together to describe his career to date. Whereas his goalscoring form has earned the headlines, it was outside the box where he was at his best against Palace, although he did pull four saves out of Guiata with more shots on target than anyone else on the pitch. Only Troy Deeney completed more passes in the Palace half for Watford than his 14, and he single-handedly stretched the Palace defence with his pace and running until he was withdrawn with a minute to go after a job well done - and probably needing a rest. After the international break Watford return their attentions to the Premier League and travel to Manchester United on March 30 at 3pm, while Crystal Palace will host Huddersfield at the same time.